Before MST3K there was … The Texas 27 Film Vault! 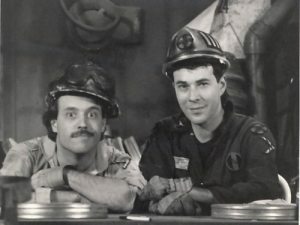 In the middle 1980s, way down on Level 31 Randy Clower and Richard Malmos, machine-gun toting Film Vault Technicians First Class hosted this neglected cult show. Balladeer’s Blog continues its celebration of the program’s 30th anniversary year. ORIGINAL BROADCAST DATE: Saturday November 9th, 1985 from 10:30pm to 1:00am. SERIAL: None. 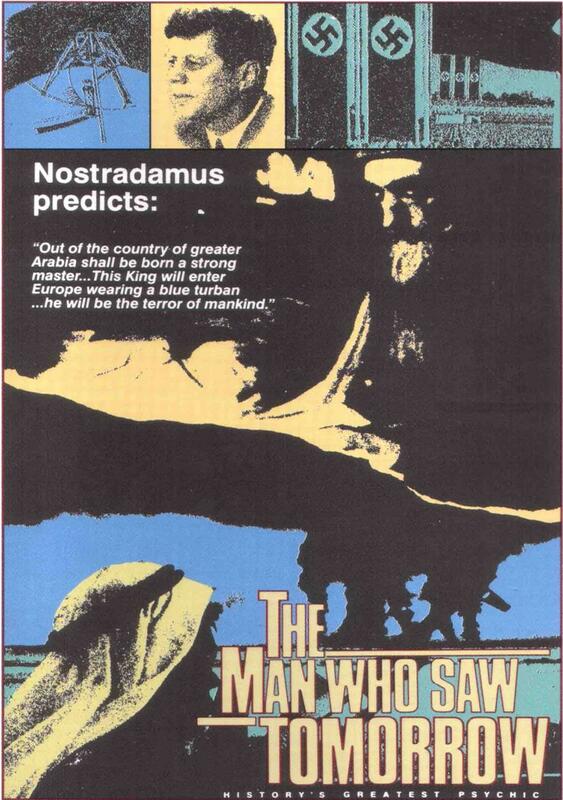 This time around the pre-movie offering was the 1953 short titled Nostradamus Says So. HOST SEGMENTS: At one point Randy and Richard read aloud some ridiculously bizarre predictions made in tabloids by “psychics” of the time period. 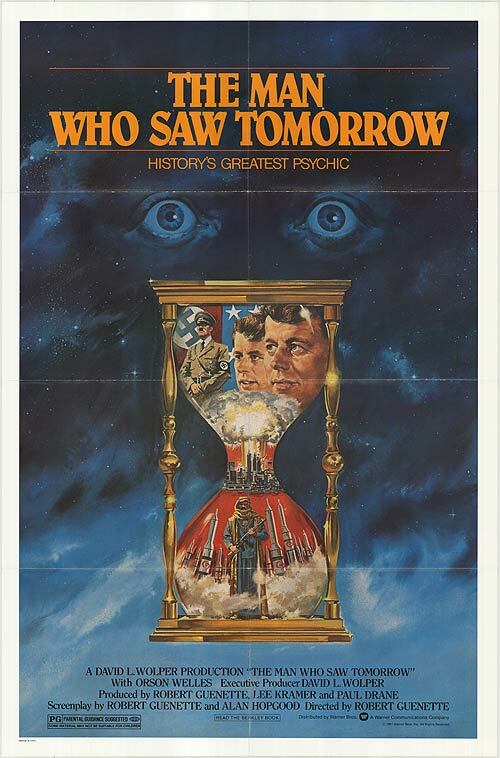 THE MOVIE: The Man Who Saw Tomorrow was a hilariously melodramatic and irrational documentary playing along with the silly notion that the 16th Century “seer” Nostradamus’ vague and noncommital quatrains predicted major future events. 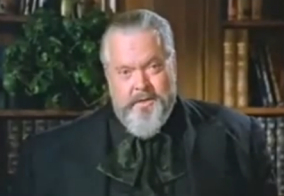 Orson Welles, in his “anything for money” phase, narrated the film. This movie was up there with the campy UFO and Bigfoot documentaries of the 1970s and 1980s. Welles, who has to hurriedly pluck his cigar from his mouth at one point so that he can be understood, seems on the verge of laughter most of the time. As usual in anything about Nostradamus meanings are forced into his centuries-old poems that make them seem like he was a “prophet” who foresaw the rise of Napoleon, World War Two, the John F Kennedy assassination and just about anything else that true-believers want to read into the man’s vague scribblings. Viewers from today can have even more fun riffing on this flick than Randy and Richard had back in 1985 since so many of Nostradamus’ alleged predictions for the 1980s and 1990s failed to come true. Plus references to “the Soviet Union’s” role in World War Three will have you laughing. Orson Welles does his best to play up the creepiness factor of the prophecies with his best Spook House voice but it’s a losing game for anyone with common sense. The movie even tells us that the then-imminent return of Halley’s Comet would bring with it drought, starvation and rampant cannibalism. Remember when that happened in the 1980s? Ah, good times. Let’s face it, Nostradamus’ gibberish is as meaningless and vague as daily horoscopes. To this very day the audience for this documentary is split between a) devotees who buy into the notion that Nostradamus predicted every single major and minor event in history and b) fans of bad movies who love to laugh at how inane the whole affair is. The Man Who Saw Tomorrow does end with a bang. Welles narrates what the long-dead Frenchman supposedly foretold about the Battle of Armageddon while actors on a cheap set act out the events. Given the location of Megiddo and the fact that Muslim nations have been violent and superstitious for about 1,300 years the Final Antichrist is depicted as the mad dictator of a Middle Eastern nation. The man’s machinations bring about World War Three and the mythical Battle of Armageddon itself. If you’re looking for a load of laughs and the cultural kitsch value of seeing the great Orson Welles spouting nonsense about bogus prophecies then this is the movie for you. Very funny! Nobody else covers this show! Awesome! Nostradamus is so overrated!